It's happening too soon! 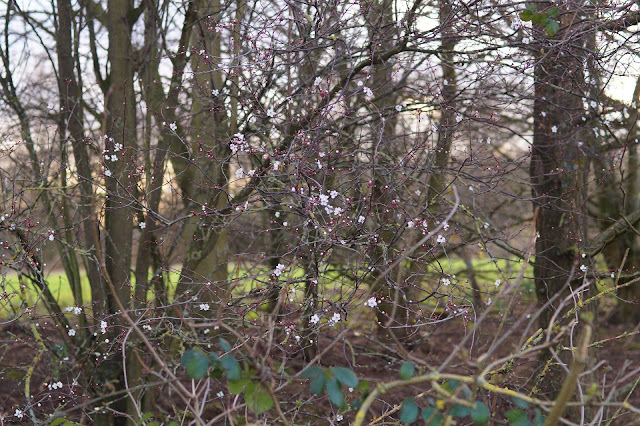 The blossom is appearing way ahead of schedule with flower buds going off like popcorn in a hot pan; unpreventable erratic explosions everywhere. It's beautiful and mesmerising but of course it's all wrong and there will be consequences down the line. If we have a hard frost the delicate flowers will all drop to the floor like confetti thrown at a wedding; the petals get trodden in to the dirt and forgotten within seconds. The startling way in which winters have changed in my lifetime alone is pronounced. I'm 30 now but when I was a child I remember winters with snow knee deep and temperatures so cold that I'd cry with the cold. The ground would freeze solid and our toes thus in turn. Frosty mornings were the norm over winter, not a rarity. Pavements were treacherous on the walk to school with ice and breath billowed with every exhalation. Times have changed. Will winters of the past get left behind as a mere figment of memory? All so true. I went outside yesterday, it was cold, not the coldest but glove worthy, and I thought to myself how easily we forget how cold it can be. I thought the same too!! I remember making snowmen on the school field every year!